Recombinant Immunoblot assay (RIBA) is a supplemental test for a reactive HCV antibody. 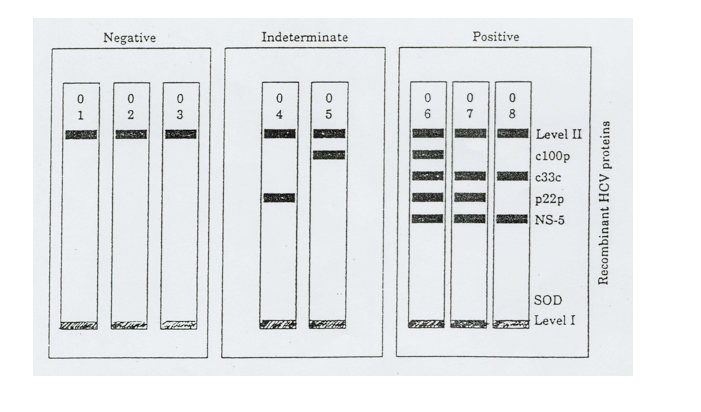 The immunoblot assay utilizes four recombinant HCV-encoded antigens, which are immobilized as individual bands on test strips. The strips are incubated with patient serum, and if present, antibodies to HCV will bind to the corresponding antigen bands on the strip. A positive result indicates past or current hepatitis C infection. This test is not useful for detection of early acute hepatitis C infection or for differentiation between resolved and chronic hepatitis C infections. Indeterminate results may occur during seroconversion after recent infection, or with chronic infection. Indeterminate results may also indicate a false positive HCV antibody EIA, particularly in a person at low risk for HCV infection. Results are reported as reactive, indeterminate or non-reactive. Specimen requirement is one plain red top or one SST tube of blood. Refrigerate after collection. Centrifuge SST tube within 20-30 minutes of draw.